These last few months I feel as if I have been in mourning. I’m at the end of an era that I’m not ready to give up. But, whether I’m ready or not, it’s happening. Most mother’s have heard this at least once in the early stages of motherhood. To be honest, I never really grasped what it meant. My response was always a smile, but in my head I’m thinking, “I can’t wait to get past…(insert difficult stage of the moment)”. I figured “enjoy them while they’re young,” is what people say when their kids are grown up and that these people really couldn't remember what it was like. The chaos, the never ending messes, the exhaustion and the noise. And I’m sorry if I ever gave you a not so gracious response when you shared this piece of wisdom with me. Please understand, I’m telling you this because I wish I had taken it a little more seriously. I know there are messy, hectic, “am I going to survive this?” moments. Of course, not all moments are enjoyable, but there are so many that are. My heart breaks over how many opportunities and precious moments I missed. Maybe I didn’t fully appreciate making sure I’m enjoying them each day because I took it for granted that they were always around, and at times I felt like I was just trying to make it through the day. But it still passed too quickly. 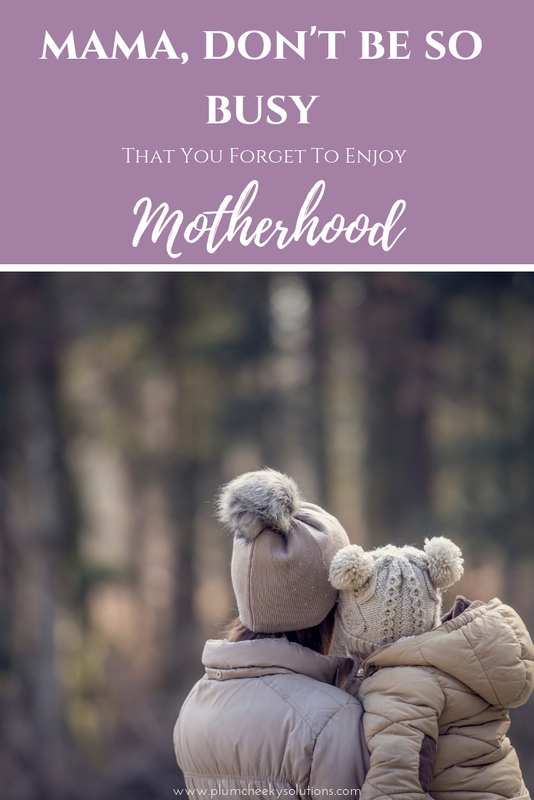 There were days I felt like the craziness that is family life with littles was never going to end, but it does and without warning. We know it’s coming, it’s inevitable that they grow up and become more independent. My eldest is now old enough to babysit and we are starting kindergarten with my baby this Fall. It’s bittersweet. There are so many days I wish I could go back and start over, or keep them little just a bit longer. Like you, I am busy. Which seems to be an epidemic in this day and age. With the never ending to do list/schooling/work/meals/etc.,it can be hard to stop when there’s always something that needs to be done. I need…and my children need, for me to stop what I’m doing and enjoy a tea party or a picnic in the backyard, eye spy or play a board game with them on a more regular basis. Someday they will grow up and move away. My children won’t always live in my home and one day, these daily opportunities will be gone. But they still need me. Children don’t need huge, elaborate outings or fancy activities. They need us to see them, to hear them and to spend time with them apart from our other distractions. I recently had a mommy “ah ha” moment. You guys, he jumps on the trampoline daily. The difference between that time and any other time? I was jumping and playing with them, without any agenda or other distractions. I was present and in the moment. And I didn’t do it nearly enough! How quickly they’re growing and how many moments I’ve wasted thinking that the to-do list had to get done and that I had plenty of time with them. That moment was an opportunity for me to learn and grow, or to beat myself up for all the times I’ve failed in this area. I’m moving forward. Please, please, don’t waste the daily opportunities.